You can import users in bulk from the Users module. Hover over the green + sign and choose "Import from Excel"
After downloading the template, fill in all the mandatory fields (those with a star) for the users you want to import. Some special characters are allowed in the file (e.g. : *&^%$#()/+=). Phone numbers should be input without parenthesis and spaces. Extension field is not mandatory. 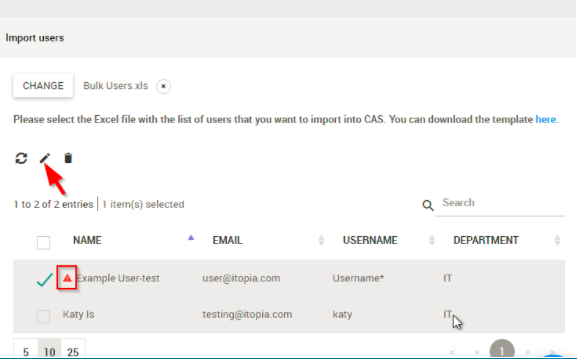 After importing the file, you'll get the list of users displayed. If you put any not allowed character in the excel file (e.g. Pat O’Leary), there will be a red triangle error as below. Users with red triangle next to the username must be edited clicking on the pencil icon. When there's no more red triangle alerts in the list, you can save it and import the users.